Although most often seen alone or in small groups, crows gather in urban areas by the thousands, possibly for protection from predators. In response to our request for phenological observations, loyal Mississippi Messages reader Eric O. recently wrote to us about the large numbers of crows getting together these recent winter evenings. 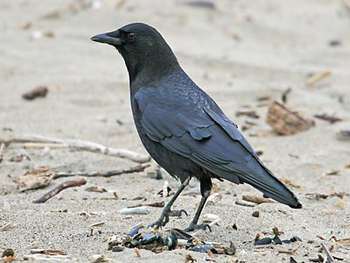 Crows, like a number of other types of birds will congregate in large numbers to roost for the night. And it seems they have been doing this for as long as crows have been around as a species. In the 1970s, a roost in Oklahoma was estimated to contain roughly two million crows. There are a couple of reasons why they may do this. Sleeping in large groups may provide some level of protection from predators. Another theory is that the roost spot is in or near an especially good foraging area. Whatever the reason, roosting peaks in the winter and decreases as the springtime breeding season approaches. To learn more about, check out this Minnesota Public Radio story, Ignore 'The Birds,' embrace the crows and visit the Cornell Lab of Ornithology crows webpage. Phenology is simply the seasonal changes that occur in nature; events tied to biological time. Phenology writings often note the first occurrence of an event  bloodroots starting to bloom, chorus frogs starting to sing  but thats not required. So have at it. Go out, observe and tell us what you see! Submit your observations, including the date and location, by selecting our names  either Karen Schik, Ecologist and Project Manager, or Tom Lewanski, Conservation Director  in the dropdown "Category" list on our online contact form. Feel free to also suggest a link to a good picture or two. Need inspiration? Check out the St. Paul Belwin Outdoor Science See what were seeing site, or the Minnesota Phenology Networks University of Minnesota or Facebook page.